SAL DeTRAGLIA'S VIRTUAL TAPAS BAR: LOST IN TRANSLATION. Whenever I’m feeling insecure about my language skills, I need look no further for reassurance than the nearest English-language advertisement in Spain. 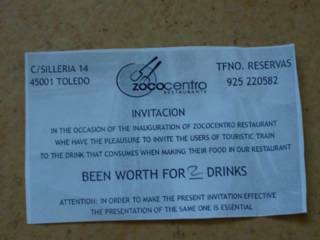 Pictured above is a restaurant coupon that my parents picked up during an outing in Toledo (Spain…not Ohio) yesterday afternoon. Take a moment and read it. 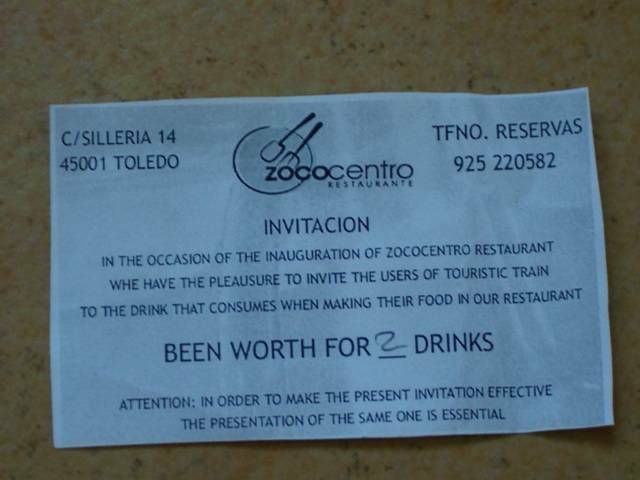 Apparently, the restaurant is offering them two free drinks with their meal. Then again…one might also interpret that the coupon is inviting them to witness the bizarre spectacle of a living, breathing beverage – no doubt brought to life by means of some devious scientific experiment – that not only cooks meals at the restaurant, but eats them as well. Read the coupon again, and you’ll understand what I mean. On the bright side, however, my parents inform that the restaurant’s food was quite good. And on that note, I desire to you all that enjoyment of a well holiday of Thanksgiving does arrive. Y yo me quejaba de los sitios japoneses y sus traducciones imposibles, jeje. Muy bueno, si señor.